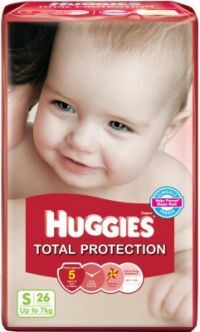 You can see list of our Huggies Total Protection Diapers Preview below, perform Side-by-Side comparison. If you need further help, do have a look at Conzumr Guides and Tips. Alternatively you can view all Diapers & Nappies to choose your own favourites. Baby's skin is very soft and tender so it is important that it receives the right kind of care. Just keeping the bottom dry is not good enough. For a healthier bottom, the skin has to be dry and fresh. That's why you need the new Huggies® Total Protection diaper. It is clinically proven* to help prevent diaper rash. Your baby's skin is extremely tender and soft. It is very important for the little one to receive the right kind of care and attention. For you as a parent, just keeping your baby's bottom dry is not good enough. You need to keep his delicate skin dry and fresh at all times. 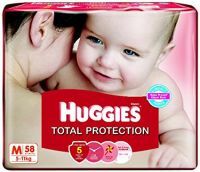 For parents who want to give their baby a total protection from wetness, Huggies Total Protection Medium Size Diapers (58 Count) is a good option. You can buy diapers online from the sellers featured on Junglee.com. Thanks to Junglee, you can buy baby products in the comfort of your home at best available deals. Your baby's skin is very delicate and is sensitive to almost everything it touches. It is very necessary that the diaper he wears is very soft and gentle on his skin. You can quit worrying about rashes, redness, sensitivity, and itchiness with this diaper. The cushiony soft liner ensures comfort for the baby, thereby keeping him happy and fresh for hours. This Huggies Total Protection diaper snugly fits your baby, making it comfortable for him to easily crawl and roam around. The snug waistband prevents your baby from skin troubles like redness and sensitivity. This Huggies diaper keeps the skin of your baby dry at all times, with its speed dry layer and advanced leak lock system. The speed dry layer is blue in colour. It minimises the scope of growth of any microbial infections on the delicate skin of your baby. The diaper has a super absorbent padding that conveniently absorbs and locks up to 6 wetting. This diaper has a cloth-like Airfresh cover that allows air to flow in and out, thereby ensuring freshness for the delicate skin of your baby. 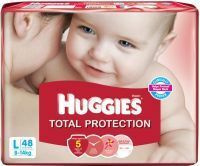 This pack has medium sized diapers suitable for babies weighing 5 kg to 11 kg. This pack has 58 diapers, each featuring a non greasy tape that makes it easy for you to fasten and refasten the nappy. 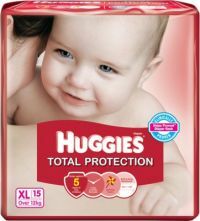 To Recieve updates and possible rewards for Huggies Huggies Total Protection Extra Large Size Diapers please sign in. To Recieve updates and possible rewards for Diapers & Nappies please sign in.